Here we are dealing with a bunch of perseverant metalheads! 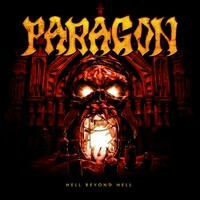 Paragon exists since the nineties and releases its eleventh studio album ‘Hell Beyond Hell’ right now! In many ways it happens to be a return to early days. Firstly they have inked a new contract with Remedy Records, the label on which they released their chart busters in the past. Secondly this album marks the return of founding member/guitarist Martin Christian and the production was in the hands of Piet Sielck. Anyways it appears to be the Paragon album that pleases us most. Naturally the band colours again nicely within the lines of traditional Teutonic heavy metal – think of Accept and Grave Digger – but it has just that extra heaviness and inspiration this time. There’s nothing wrong with speedy tracks like the wild hacking ‘Stand Your Ground’ or neck-breakers like the title track or the fervent ‘Rising Forces’. Those who want some more depth and nuances, go for the longer tracks ‘Heart Of The Black’ and occluding epos ‘Devil’s Waitingroom’ in which calmer passages loom up. This is a stalwart headbangers record without pretension. Hier hebben we te doen met een stel volhouders. Paragon bestaat sinds de jaren negentig en brengt het elfde studioalbum ‘Hell Beyond Hell’ uit. Het is in meerdere opzichten een terugkeer naar vroeger. Ten eerste hebben ze een nieuw contract met Remedy Records getekend, waarop al hun kaskrakers uitkwamen. Bovendien markeert dit album de terugkeer van oprichter/gitarist Martin Christian en was de productie in handen van Piet Sielck. Het is alvast het Paragon album dat ons het meest bevalt. Natuurlijk kleurt de band weer aardig binnen de lijntjes van traditionele Teutoonse heavy metal – denk aan Accept en Grave Digger – maar men gaat er net wat heftiger en geïnspireerd tegenaan. Niets mis met speedy tracks als het wild hakkende ‘Stand Your Ground’ of nekbrekers als het titelnummer of het vurige ‘Rising Forces’. Wie wat meer nuances wil, stemt af op de langere tracks ‘Heart Of The Black’ en uitsmijter ‘Devil’s Waitingroom’ waarin kalmere passages de revue passeren. Een stevige headbangersplaat zonder pretenties.